Terrific Beach Getaway! Great Location! Sleeps 2-4! Enjoy staying at upscale Sullivan's Island in a lovely fully furnished condo available weekly and nightly (3 night minimum), located within a five minute walking distance to the beach and restaurants (Poe's, Sullivan's, Mex 1, Cafe Medley, Tacomamacita, High Thyme, Co Op, Home Team BBQ, Obstinant Daughter). Fifteen minute drive to historic downtown Charleston and airport. Previous renters have been very pleased with accommodations, location, hospitality,and cleanliness. Condo includes granite countertops, porcelain tile floors, and colorful furnishings. See guestbook comments on this website. Condo includes queen size bed, full bath, kitchen, and living room (32 inch flat screen tv). There is also a memory foam full size sleeper sofa in the living room. Unit is first floor with convenient parking at the rear of the building. Laundry on-site. You are welcome to bring your own queen size linens and towels which the $30 linen rental fee would then be waived. Linens available for $40 rental fee (4 bath towels, 2 hand towels, 4 washcloths, and two sets of queen sheets). Two beach chairs provided for renter's use. Wifi available in the condo. Very convenient location! Perfect for honeymooners, for anyone who loves history, or for anyone wanting to relax in a family-oriented beach community. Quiet, safe, and comfortable. Sorry no pets and no smoking. You can catch a ride to Sullivans Island and walk everywhere, or just park your car and not move it for the week. It's a wonderful place to relax and enjoy the beautiful, friendly atmosphere that the Charleston area has to offer. If you are interested in fishing, please ask me for more information on inshore fishing trips. View our other property next door by searching listing #183880. I have owned my condos (VRBO listing #176556 and #183880) for many years. Nine years ago, I decided to rent my condos through VRBO. It has been a joy communicating with guests from all over the world. I take care of my own two condos, and I take pride in the appearance and cleanliness of the condos, as well as the comfort of my guests. It is very rewarding when my guests come back for repeat visits. People often fall in love with the area. I have a real estate license and would be happy to help with your real estate needs if you would like more information on properties in the area. We bought a vacation rental at Sullivans Island because of its beautiful scenery, family friendly atmosphere, and closeness to historic downtown Charleston. After spending many years vacationing here, we decided that this was home. Enjoy a daily walk on the beach at one of the Southeast's most beautiful islands. Visit the historic sites that Sullivans Island has to offer including Fort Moultrie, the Sullivans Island Lighthouse, the fabulous view of the Charleston Harbor and Fort Sumter. Dine at the nine popular restaurants just within a one to two block walking distance of the condo. If you are not familiar with the area, the owner is happy to recommend popular attractions, restaurants, golf courses, sunset cruises, etc. If you've ever read any of Dorothea Benton Frank's books, then you will appreciate the relaxed, friendly feel of a stay at quaint Sullivans Island. Shopping is also fun in the area with the downtown Market, many antique shops, Mt. Pleasant's Town Center, and nice variety of consignment shops. A short walk on a convenient wooden boardwalk takes you to a beautiful beach. Park in the space marked "7" on the ground. There will be a green parking pass for the dashboard of your car. Please return the pass upon departure. Wifi availabile. Password provided upon check in. 5 minute walking distance to the beach, restaurants, park, swings/playground, tennis courts, library, and post office. Wifi is available at nearby restaurants. Great location & wonderful host! 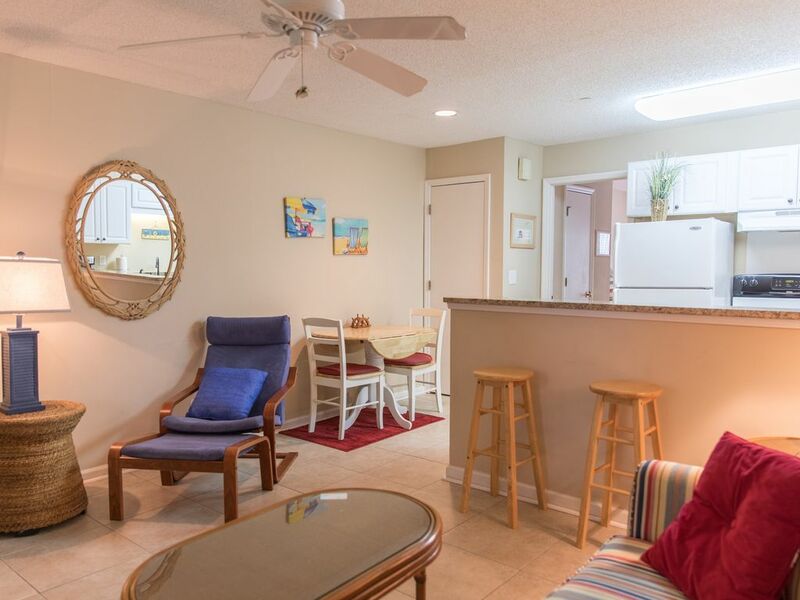 This condo met all of our needs - it was a great location only a 5-minute walk to the beach and right next to the restaurants, park, farmers market, etc. Obstinate Daughter/Beard Cat was an excellent place to eat and enjoy the sun & breeze with a gelato in hand. Getting over to Charleston and other areas was quick and easy. The condo was clean & comfortable and we enjoyed the little side deck/porch area as well. Having the beach chairs available was great - we used those a few times. Carol was really sweet and accommodating. She's a great host! We definitely recommend this place. The owner, Carol, is very nice and helpful. The description of the condo on VRBO is not dishonest (e.g., it really is a 5 minute walk to the beach). We cut our stay short and left a day early, however, because the condo did not feel comfortable. It just did not feel like a vacation rental, and had we had the ability to see the inside and especially the outside before renting, we would not have rented this particular condo. The outdoor surroundings (the building and "courtyard") are unattractive, and it looked more like a low end apartment complex. I recommend looking at it on Google Maps before you rent. Granted, we didn't rent a condo on Sullivan's Island to stay inside or admire the outside. Having said that, the condo really is quite small and somewhat dark, it had an unpleasant odor that we noticed immediately when we walked in, the bathroom is teeny tiny, the sheets and towels (that we paid an extra fee to use) were worn and thin, and the sheets were rough. Overall, this condo is way overpriced and should be a $100-125 rental, not what we paid. across the street from the condo building. Again, we are sorry that our condo did not meet your expectations. We hope that you will return to Sullivans Island again someday to visit the many attractions and fabulous restaurants the Charleston area has to offer. Thank you for your review of my condo. I'm happy that your needs were met during your stay. The building behind the condo is called Battery Thomson, a historical artillery landmark on the National Registry of Historic Places. The battery was built in 1906 and was used to protect the Charleston Harbor. Sullivans Island is full of interesting historical facts. Thank you again for staying at my condo. We enjoyed our stay here, great location! Carol’s place was clean and cozy with a location that couldn’t have been better. It was an easy walk to the beautiful beach and to the great local restaurants on Sullivan’s. Beach chairs (3, one for each of us) and an umbrella were provided. The bed was very confortable as was the pullout coach which seemed brand new. The shower was great, plenty of hot water. There was a full kitchen with all the basic amenities. We had our own parking which was a plus on a busy holiday weekend. The overall space was quiet and comfortable. We would definitely come back again! Carol was very responsive and quick to reply to any questions. Thank you for your review. I appreciate your feedback. I’m glad you had a nice time. I hope you’ll be back again for another visit! Clean retreat, steps from the beach, great host! Carol promptly answered every question we had. Checking in and out was a breeze. And at the end, Carol graciously refunded the cleaning and linens fees for us after we cleaned the place before leaving and brought our own linens - a great option for anyone who might be on a budget like us. Thank you for the nice review! It means a lot to hear that my guests enjoyed staying at my condo. I hope you'll be back for another vacation to Sullivans Island soon! We enjoyed our stay at this condo on Sullivan’s Island! A great, relaxing spot with wonderful restaurants & beautiful beach. Fort Moultrie National Historic Site and Museum is located 1/2 mile from the condo. 5 minute walk to the unique Sullivan's Island lighthouse. Golf cart and bicycle rentals available nearby. Drive 15 minutes into downtown Charleston and enjoy fine dining, theater, museums, concerts, and shopping. Take a horse drawn carriage ride and learn the history of Charleston. So much to do and see in this beautiful area! There is a strict no pet policy for renters at the condo complex. Pets are not allowed! Smoking is also not allowed in the condo. I take special care of my condos so that they are nicely kept for each renter. Thank you in advance for taking good care of my condos during your stay. I really appreciate it! The $100 cleaning fee can be waived if you leave the condo the way that you found it on check in. Cleaning supplies are available in the condo. The $30 linen package includes four bath towels, two hand towels and four wash cloths.